Hello everyone, Today we will learn about niche blogging. In addition to knowing what niche blogging is, we will also learn about some other facts related to it. So let's know. For example, if you have a blog and you write blog posts about only food products on that blog and publish it, then you are blogging food in a way or say that niche is blogging that has niche food . It is hoped that by this definition you have understood the meaning of niche blogging. Now it is inverted, multi-niche blogging, which has been running much trend nowadays. The one who does the heart, puts on his blog. 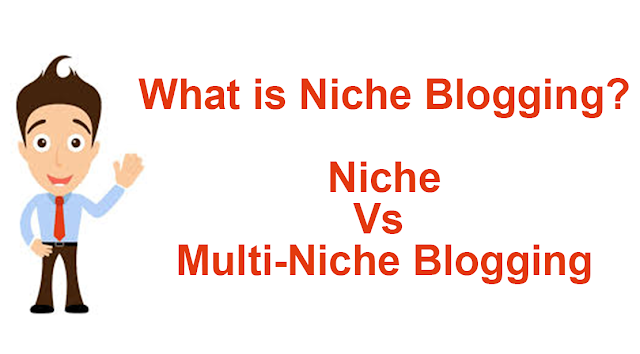 But there are many differences between both multi-niche and niche blogging. They also have different advantages and drawbacks. So let us know a little bit about those things too. Niche blogging is a benefit in itself. If you are interested only about a particular topic, then writing a lot of blog posts about that topic will be very important. If we talk about making money from our blog, niche blogging is very beneficial for that. Now how? If we look at reduction, then one of the biggest shortages is that if we publish another topic on it, then it can have a negative effect. In this way we are simply tied to one of our fixed subjects. The first major advantage of multi-niche blogging is that you can target search engine traffic for any keyword if you wish. There is no restriction on you that you only have to blogging on a particular topic. Multi-niche sites are also good for simple advertsing, which are based on impressions only. If we talk about drawbacks, then the first thing is that these sites are not great for affiliate ads. You can not earn as much as niche sites from these sites, even if your multi-niche site traffic does not exceed it. To rank multi-niche sites in search engine, it has to compete very strongly from niche sites. Which of the two is better? Niche or multi-niche blogging?